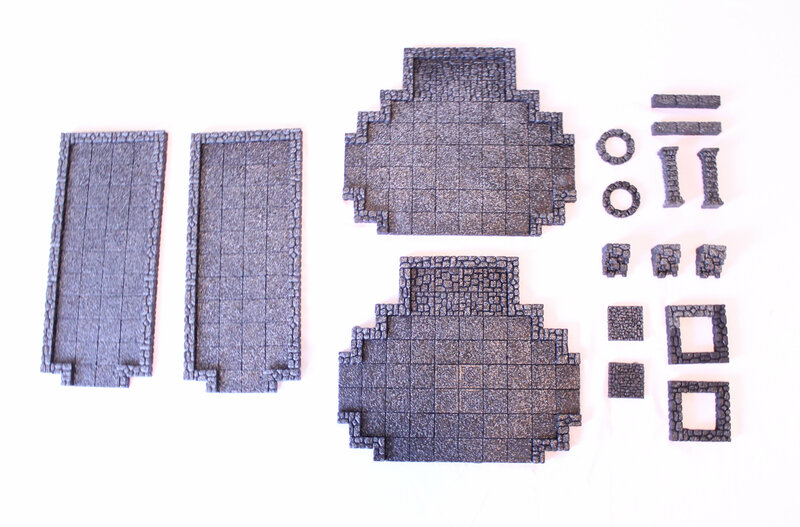 DrakenStone Deluxe Inner Sanctum Set... MADE IN USA!!! Each piece is made of ONE SINGLE SOLID pour of resin by our Elves. 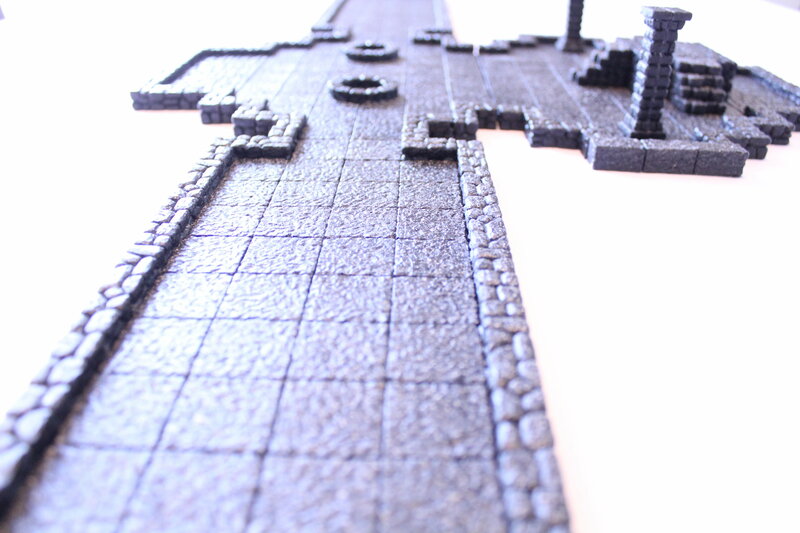 NO GLUE is used in any of the rooms or pieces, except for the tall columns. 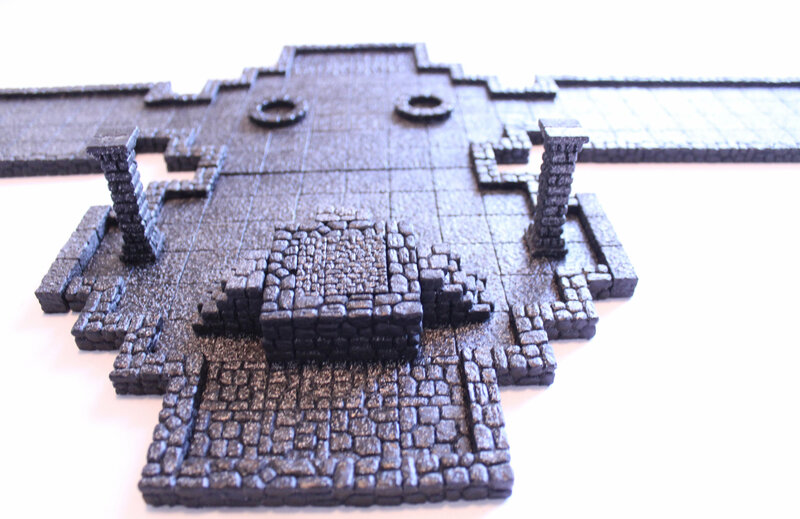 Your set arrives READY to add to your game immediately, with NO ASSEMBLY by the customer. Each room has one or more 2" wide openings where a door could be placed. 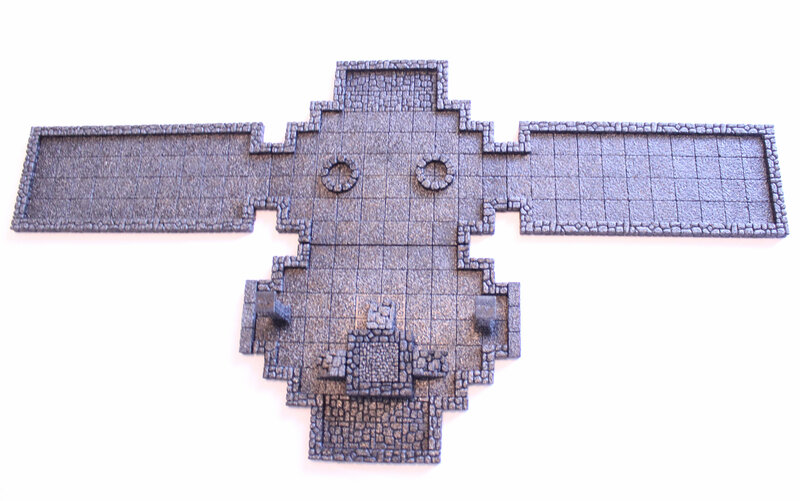 These openings have a 1" gothic flagstone floor tile pattern, which matches up perfectly to adjacent rooms. 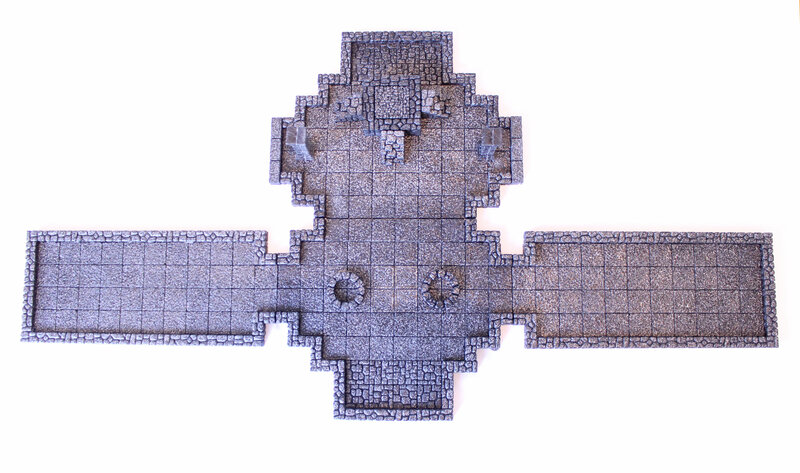 Infinite modular patterns can be made, so that your dungeon layout is different every time. The doorways have tiny MAGNETS embedded below the surface, and are completely invisible. 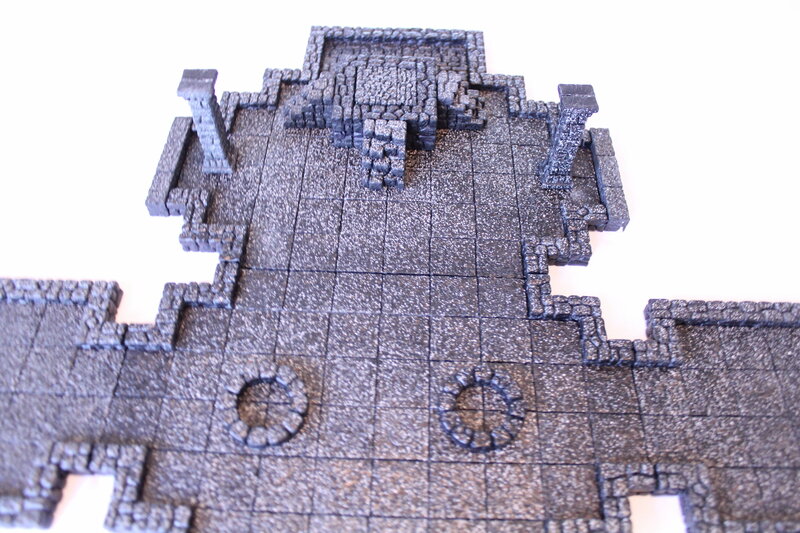 This allows the rooms to "snap" together. Each floor tile square is exactly 1" by 1". Question: Is your glue strong? Answer: Yes. It is literally stronger than the resin material itself. We use clear Cyanoacrylate glue. It is not affected by heat or moisture. FAQ: Does your resin warp? Answer: No. We've experimented with many materials. We've found that "flexable" resins are less expensive, but must be stored flat. We needed something unbendable, stiff, and hard as a rock... but lightweight. So we partnered with Reynolds Advanced Materials in Detroit. We combine White Featherlight Resin with Black Onyx Resin, resulting in a very realistic gray. This resin is 80 Durometer hardness and will not bend. 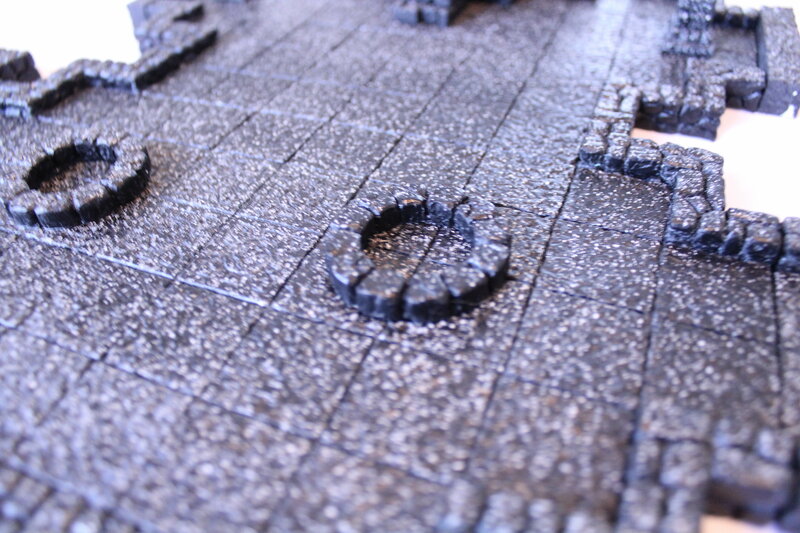 Then we add graphite dots to give it a granite look, then silicon texture crystals to make it more "bumpy". The effect is VERY REALISTIC looking granite. Question: Are your colors consistent? Answer: Yes. When you place your order, we mix enough material to make the entire order. This is called the "dye batch". All rooms and accessories are made from this dye batch, guaranteeing that all pieces match color. However, if you order more pieces at a later date, we make a new dye batch. Even though we use the exact same formula, slight color variations are possible. To get around this issue, the pieces can be "washed" in watered-down black paint, which colors only the cracks, nooks, and crannies... giving all the pieces the same shade. Either acrylic paint (water-based) or model paint (oil based) will work fine. 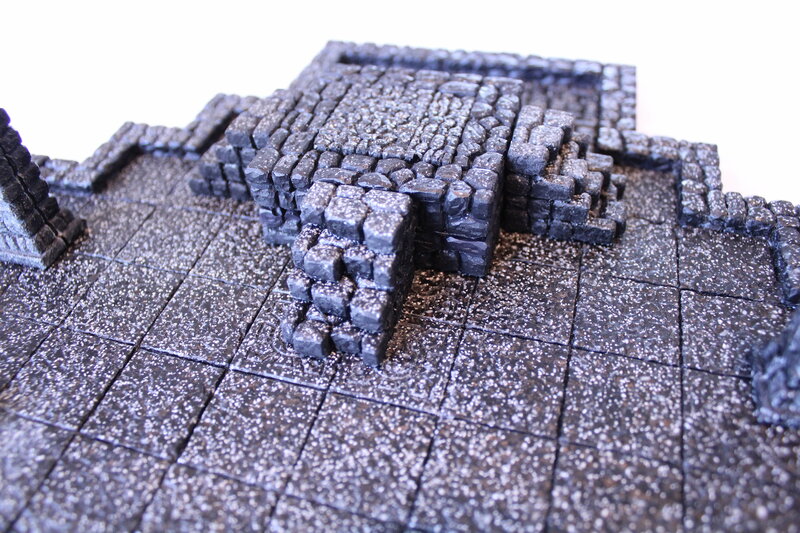 Priming is not necessary, although spray paint will work fine... however, it does cover up the granite look. Question: How will my Inner Sanctum be shipped? Answer: Carefully. 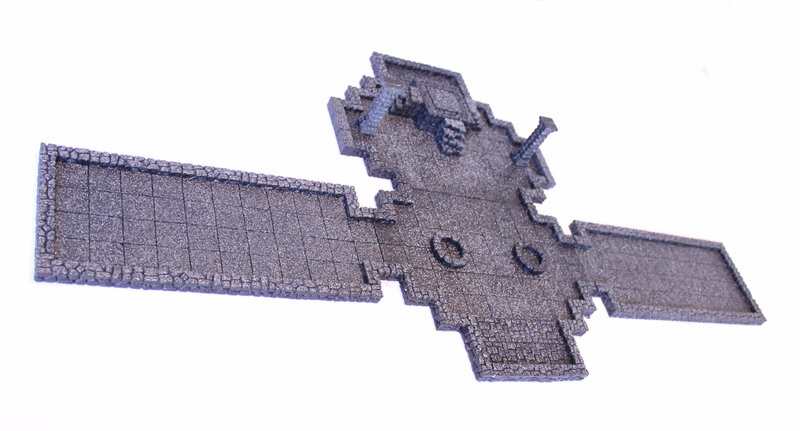 We ship each room FLAT, on a piece of 1/2" styrofoam between each layer. We cut the foam to fit perfectly into the box. 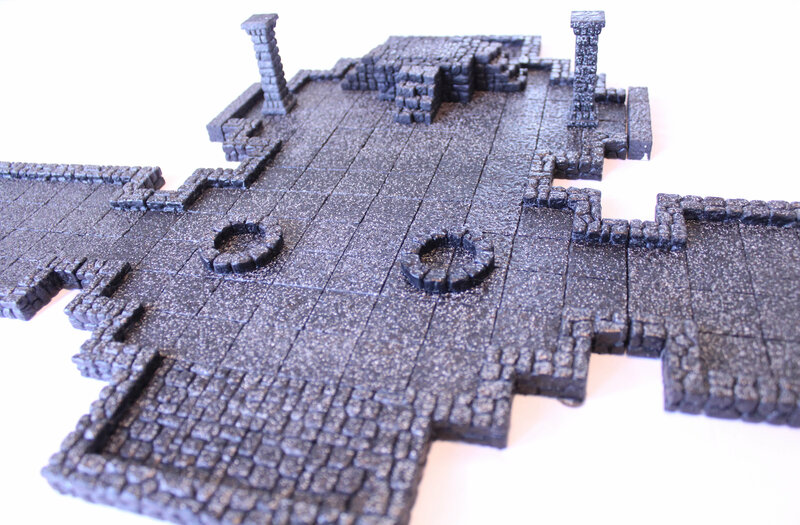 It is recommended that you keep the foam and the box to store your terrain.